Combined Aviation + Security course to fast-track your career. Get fast-tracked to a career in aviation security with this dual qualification. This course includes everything needed to pursue a career as an Aviation Protection Officer. The Australian Department of Home Affairs – Aviation and Maritime Security (AMS) Division) recognises the Certificate II in Aviation Transport Protection as a benchmark standard for security personnel employed in the sector. Participants on this course will undertake screening operations at a fully functional screening facility. Certificate II Aviation Transport Protection is also available as a stand-alone course. Click here for details. 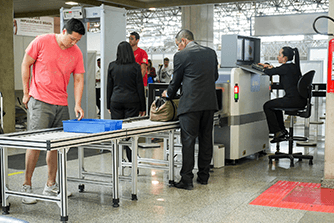 These qualifications will enable you to work in security screening roles at major, regional and international airports. Eligible participants will also be able to apply for a QLD Class 1 Security Providers Licence with the Security Officer (Unarmed) function and work in a variety of other security roles. Be an Australian Citizen, Permanent Resident or hold the appropriate Visa to work within the Security Industry in QLD. Please note, we are unable to train international students or those on a student visa. Participants should not have any injury or physical disability that prevents them from standing for long periods, lifting luggage or visual impairments that prevent them from accurately and consistently monitoring images on a computer screen for continuous periods of up to 20 minutes. This course is based on the requirements of local, regional and national airports for Aviation Transport Protection Officers. For more information with regards to more elective units, you can contact your closest ASSET office. The face to face component of this course for Certificate II in Security Operations will run for 7 days (Unarmed only). The aviation component of this course is run face to face for 5 days. In total, you will be required to undertake a minimum of 12 days face to face training. You will also undertake training and assessment in a live screening facility during this course. Recognition of Prior Learning is available for this qualification. Please note however, we are unable to provide RPL on the Certificate II in Security Operations course if required for licensing. Note: Security Screening Officers are exempt from holding a Security Providers Licence however most employers prefer that you hold a licence and doing so increases your employability in other areas. Follow our Asset Recruiting Facebook page for the latest updates. Security Screening Officers are exempt from holding a Security Providers Licence however, most employers prefer that you hold a licence and doing so increases your employability in other areas. If you’re still undecided about undertaking a career in security, you can register for a free career information session to help you make an informed decision. These are complimentary and are run every week! Want to get started on your job applications now? Register your interest now via the following links. “I email you in response to the training Course in Security/Screening recently conducted on Norfolk Island. I offer my thoughts on the training. Craig Tyson – the Trainer arrived on Norfolk Island and commenced the course immediately. He is a great asset to your organisation. I found him to be all of the following: intelligent, witty, charming, informative, pleasant, instructive, a communicator and and all round pleasant gentleman. As the only ‘girl’ in the group, I was treated with respect and courtesy. These are all ‘old fashioned’ words in today’s world, but hopefully still carry the meaning. Thank you as the course provider. I enjoyed the challenge of the ‘speed’ at which it was efficiently delivered. We had a nice working group and Craig recognised each persons abilities. The course covered all of the aspects and the print-outs provided were great and hopefully the answers were correct! Thank you for the Certificates you forwarded to us. Most impressive. Your organisation was promoted by Craig and other courses were offered to us for completion.